Prequels tend to be a bit inert, dramatically speaking. We already know where the characters' arcs are going to end up, how they're going to get there; we've already lived through the most important, interesting time in these characters lives. Superhero comics bypass this problem through a neverending string of retcons, resurrections, reversals, and rsliding timelines, devices that are both much derided and absolutely necessary to the way the industry wants to work at this time. But with something like Star Wars, a long-running, much-loved film property with a big budget sequel coming out soon, that level of change is almost impossible. So, when it was announced that Jason Aaron's Star Wars series, which would welcome the franchise back to Marvel after years with Dark Horse, it would take place 'between movies', I had to temper my excitement a bit. Without changing up the genres a bit (which I absolutely think they should do, and highly doubt they will for awhile at least) or pulling the focus back to a character level, what else could they say with this precise combination of characters? And yet, here we have a brand new Star Wars book, the classic team returning to classic sci-fi action. Cassaday's art is lovely, as is typical, though he occasionally feels trapped by the actors who originated the roles. He is trying to make Luke look like Mark Hamill, Han to look like Harrison Ford, etc... and that's something everyone is going to have to let go of quickly, because going for something approaching photorealism often leads to stiff visual storytelling, especially in the action. 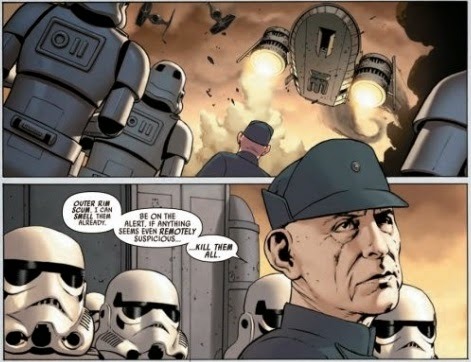 Still, Cassaday was a brilliant choice to bring Star Wars to Marvel; few artists are as talented at the 'cinematic' style of Frank Quitely and Bryan Hitch, and a few of Cassaday's shots look like lost storyboards for a movie we'll never see. I don't think it's a spoiler to say that Darth Vader shows up, or that the issue builds to a possible confrontation between he and Luke. There's literally no other reason to set the series between Star Wars and The Empire Strikes Back. But this is emblematic of my issue with the series as presented. Darth Vader won't have any particular revelation for Luke. He's not going to say, "Luke... wait, I think I know your Aunt." The best we can hope for is a decent fight sequence, but action has never been Cassaday's strongest suit; how can it possibly top the choreography and raw emotional power of their Empire fight? It's possible that it can, sure, but given how, say, Vader and Chewbacca's brief confrontation plays out, I'm not entirely sure that it will. Where's the drama in all these interactions? I genuinely don't mean to sound too negative. Jason Aaron and John Cassady's Star Wars #1 is fun. Long time Star Wars fans looking to spend a bit more time with classic characters in a classic incarnation will almost certainly have a blast here. But there's a hollowness to Star Wars #1, a predictability, that worries me for the series' long-term creative success. Part of why I fell in love with Star Wars when I was young was the sense of adventure, of unpredictability - it was a universe where anything could happen and anyone could become a hero. And since that first movie, the best Star Wars media has been the ones that divorced themselves most thoroughly from the Skywalker saga, like Genndy Tartakovsky's Clone Wars shorts or the Knights of the Old Republic games. Star Wars #1 lacks that spark, that energy; it feels a bit like a toy that's been preserved too long in its original packaging, something to be admired but never fully enjoyed. Star Wars #1 was written by Jason Aaron, illustrated by John Cassaday, colored by Laura Martin, and lettered by Chris Eliopoulos, with variant covers by [everyone in the universe]. 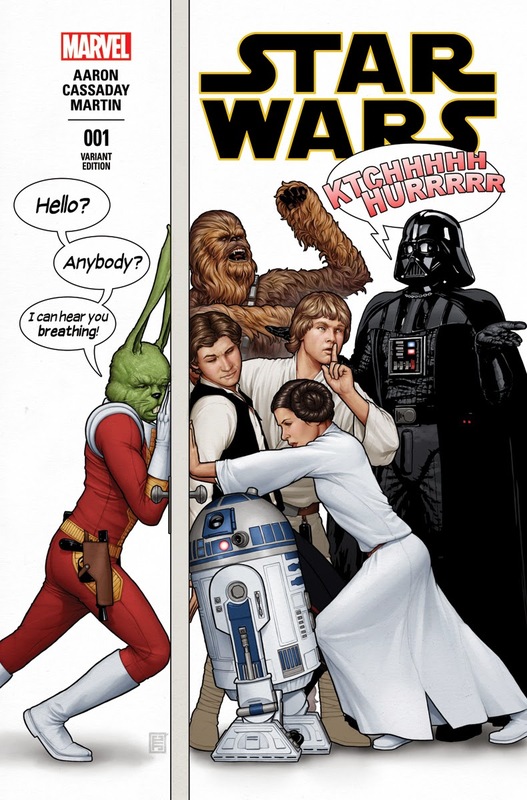 Published by Marvel Comics on January 14th, 2015, Star Wars #1 has a cover price of $4.99.